Bay Breeze Soap: And now....The Loofah. A short history. And now....The Loofah. A short history. See the entire story http://www.spectatornews.com/showcase/2007/03/15/the-history-of-the-loofah/The loofah. Most people use it for showering. It’s generally used for exfoliating dead skin and can also be used as a sponge, said Tom Colgan, owner of Loofah by the Inch. But where did it originate? 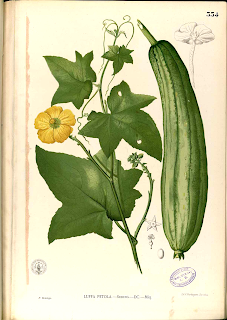 “Many people think that loofah comes from the sea,”Loofah, also spelled “luffa or loofa,” is a vegetable. It’s considered a gourd, and is related to the pumpkin and squash. The gourd is believed to have originated in Asia, and Egyptians used it as a sponge. According to an article written by biologist David Erickson and published by the Proceedings of the National Academy of Sciences in the United States of America, the loofah traveled to America about 10,000 years ago and was considered an “Old World” plant, meaning it is native to Asia and Africa. People who settled in America brought the plant to domesticate it. It’s considered a “utility” species and was one of the first plants to be domesticated. Radiocarbon dating has shown the gourd has been in America for over 9,000 years. It’s now used mostly as sponges. However, its gourd was used as filters on ships prior to World War II. It has also been used to stuff pillows and for insulation. Although it originated in Asia, it is now a very important part of South American agriculture. It’s called the “poor man’s kitchen and bath sponge,” because it can scrub the kitchen and is used as a bathing tool. University of Wisconsin-Eau Claire since 1923. 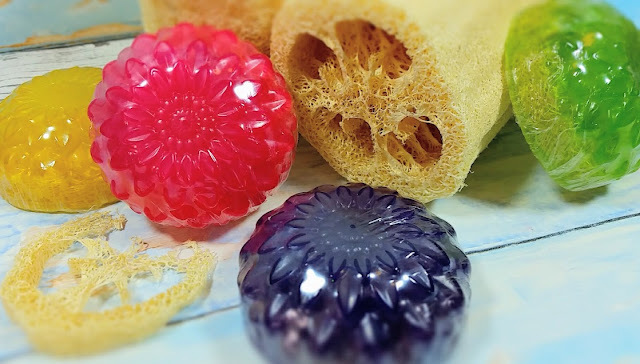 I've cut slices of luffa and made fun and exfoliating glycerine soap. These cuties are available for purchase. In person sales $5.00 each. and receive a free soap cupcake! Seems my comment box doesn't work any longer in Blogger. That's OK, the best communication is commenting at Facebook anyway.